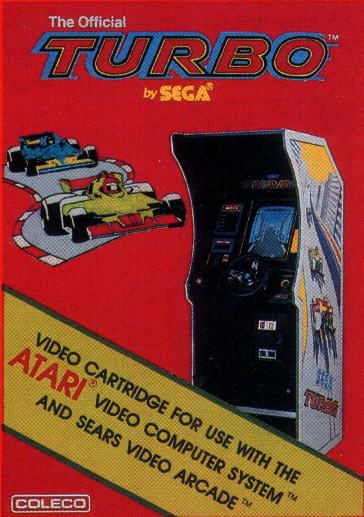 Based on the 1981 Sega Coin-Op of the same name, Turbo is one of those prototypes that everyone was sure existed somewhere, but never seemed to turn up. Not only had Turbo been demoed at the 1983 CES show, but Atari also had added it to their list of upcoming releases after buying the rights to the Coleco library in the late 80's. After several rumored sightings and one very elaborate April Fools day prank, it seemed doubtful that Turbo would ever turbo up. Thankfully all this changed when former Atari 2600 programmer Anthony Henderson happened to stumble across his long lost copy of Turbo while searching his attic. 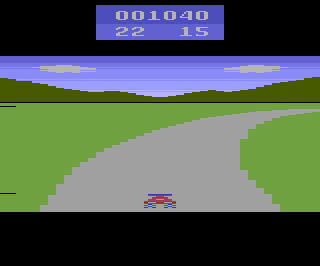 Although Turbo shares many things in common with other well known racing games such as Pole Position, Turbo was actually one of the first games of its kind. Turbo was well known at the time of its release for having large, brightly colored, and detailed graphics along with amazing sound effects. Turbo went on to be one of Sega's best selling arcade games and was produced in both a regular stand up and a special cockpit model. 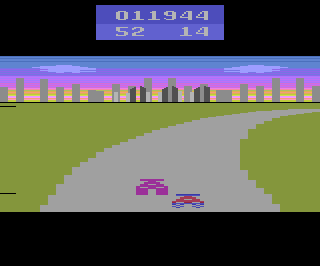 The object of the game is simple, pass as many cars as possible in the given time limit. If the player managed to pass at least 30 cars before the timer ran out then the time was extended, otherwise it was game over. Of course it wouldn't be a game without obstacles to get in your way, in Turbo these obstacles include other cars, water puddles, and even ambulances! The first thing you’ll notice is that Turbo is one of the few 2600 games to include a proper title screen. Upon power up, the player is treated to a amazing looking starter light that moves from red to green. Once the light turns green, the game begins. Like the arcade game, there are various screens (stages) that the player must travel through. According to the programmer each stage represented part of a day, with a full day taking 8 screen. This means that the game would start at sunrise, and 4 screens later it would be sunset with another sunrise 4 screens after that. Unfortunately not all the screens were completed so they appear to be a little out of order. Although it may not look like it due to the 2600’s graphical limitations, this is the city stage from the arcade game. 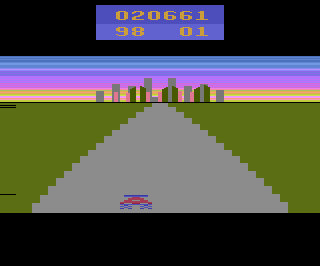 Whereas the arcade game was able to display large buildings on each side of the screen to give the player the illusion of driving through a big city, the 2600 version has little blue buildings that move on the sides of the screen now and then. Although some of the graphical magic from the arcade version is lost here, the programmers managed to implement one of the best looking sunrises ever seen on the 2600, even rivaling the famous Activision sunrise. This stage is a little tougher than the first since the cars come from around a curve and are a little harder to see. 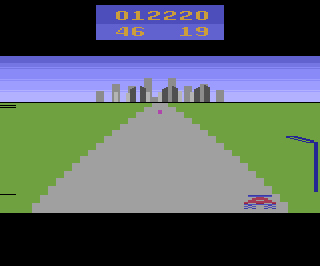 Unlike the first stage, this stage is missing the moving objects on the side of the screen (more about this later) which combined with the lack of moving road edges takes away all sense of speed. It is believed that this screen was a replacement for the stage from the arcade game that featured a curve with water on one side of the screen and a wall on the other. This was something that the 2600 obviously couldn’t do. This is one of the more interesting stages in the game, as it has the player driving through a darkened tunnel. Most of this screen is black (which suits the 2600’s graphic capabilities just fine), with the occasional pillar of light on the side of the screen to give the player some sense of movement. This particular stage doesn't show up as much as the others, probably because there weren't many variations the programmer could do with the graphics since it had a solid black background. This stage is very similar to the second stage, but features a city in the background instead of hills. If you think of the game course as going in a big circle, this stage would represent the player driving back towards the city. As with the second stage, there are no moving objects on the side of the screen taking away the players sense of movement. This stage is similar to the first stage, except that it takes place in the daytime and features moving lamp posts on the sides of the screen rather than buildings. On a side note, the black buildings in background city are modeled after Penzoil Place, an office building in downtown Houston. This stage is a lot like stage four, but the colors are different (sunrise vs. sunset). This stage is almost identical to stage five, but features trees instead of lamp posts. Once again, this stage is very similar to stage two, but features a nice sunset. Ahh, a new background! Well sorta, this is really the city stage again but with mountains in the background and snow. 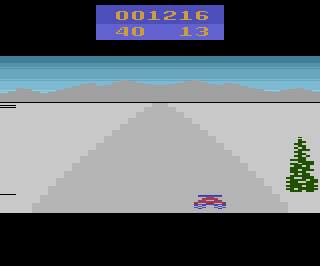 Although the ground looks snowy, it in no way affects the controls of the car. This stage is the same as stage 2. 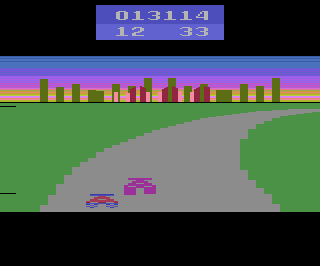 It is believed in the final release that this stage would have different obstacles on the sides of the roads than stage 2 such as lamp posts instead of trees. This stage is exactly the same as stage six. Similar to stage one, but this time there are lamp posts instead of buildings and the colors are different. This stage is the same as stage eight. This stage is similar to stage 9, but features a nice sunset instead of snow. There are also lamp posts on the sides of the road instead of trees. This is the final stage of the game before it repeats back to stage one. Due to a glitch in the game, the player can see this stage by simply pressing the reset button while on any curve stage. Although playable, Turbo remains incomplete. The main gameplay elements are all there, but many of the graphical extras have yet to be implemented. This includes the movement of the edges of the road that give the game a sense of movement. 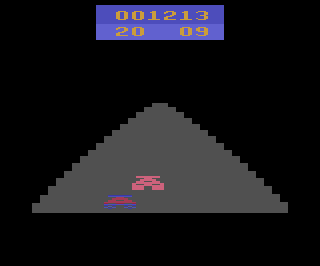 According the programmer, Coleco originally wanted the game to use paddle controllers in order to better simulate a steering wheel. 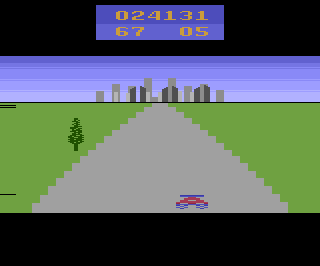 However reading the input from paddle controllers takes up considerably more clock cycles than reading regular joysticks, and there was not enough time to animate the road edges. 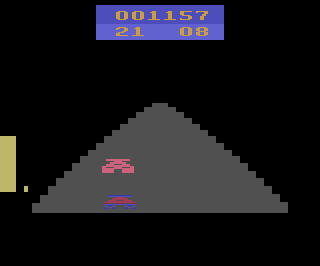 After pleading with Coleco, they were allowed switch the game from using paddles to joysticks, which freed up enough time to insert the road edge movement but the game was cancelled before it was actually implemented. Other missing features include the ambulance, water puddles, and the enemy car AI (although implemented in the current prototype, it was never tweaked and finalized). 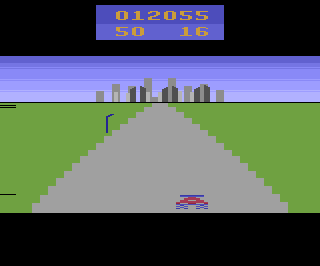 The game difficulty also needed to be tweaked a little as dodging oncoming cars in this version is more a matter of luck than skill. According to the programmer there was actually one more revision of the game completed before the project was cancelled that included moving trees on the sides of the road on the curve stages. It is unknown what happened to that particular prototype. As this is an incomplete prototype, there are a few bugs and glitches present in the game. The biggest and strangest of these allows the player to change the background on certain stages. 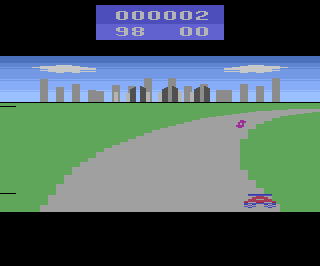 If the player presses the reset button on any of the curve stages, the current background will be replaced with a cityscape at daytime (stage 16's background). It is unknown why this happens, but it may be a glitch in the bankswitching upon reset (curve stages are stored in one bank while straight stages are stored in the other). Another odd glitch involves the acceleration sound becoming very high pitched (sounding as if your engine is about to blow) if the player is at full acceleration when switching screens. Thankfully the sound goes back to normal shortly afterwards and does not hurt the gameplay in any way. There are numerous bugs involving the enemy car AI including having your car destroyed multiple times in a row because it was continually hit from behind. Another item of note is that the Cars Passed counter only goes up to 41, even though the player can continue to pass cars. This is a bug as it was supposed to go up to 99. So why didn’t Turbo get released? Ironically it was because of a car accident. Lead programmer Michael Green was hit by a drunk driver while riding his bike and was seriously injured. Since he couldn’t work on the game while recovering in the hospital, the deadline came and went without the game being finished. 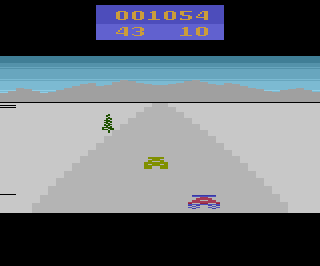 As it turns out the game was already behind schedule due to the time spent by the programmers switching the control scheme from paddles to joysticks. By the time things got rolling again, the game market had started to collapse and the Coleco declined to release the game. 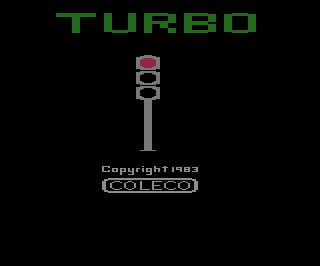 Interestingly, many years later Atari bought up the entire Coleco 2600 library of games including Turbo. While Atari only ended up re-releasing a handful of Coleco titles (Donkey Kong, Donkey Kong Jr., Venture, and Mouse Trap), Turbo was put on the master part list. It is unknown if Atari was considering finishing up Turbo, or if they simply added it to the list before knowing that it was incomplete.